In the above video, VoxxLife Founder Jay Dhaliwal explains the break-through science, research and resulting benefits of the Voxx HPT Technology. In this video, VoxxLife Founder Jay Dhaliwal gives a quick overview of the Voxx HPT Technology & benefits. We reviewed and studied decades of research in brain stem functionality and the peripheral nervous system. We also reviewed the latest research in sensory mechano-receptor mapping, brain activity correlated to acupuncture, as well as dermatome stimulation and the different somatic pathways. We also studied secondary and free receptors and related nervous and brain activity. Our intent was to investigate if there was an integrative correlation between the different sensory receptors, the peripheral nervous system and the functionality of the brain stem. To understand the development and impact of VOXX HPT, one has to understand the relationship between the human peripheral nervous system and brain stem and the various nuclei therein. The peripheral nervous system (PNS) connects the central nervous system to environmental stimuli to gather sensory input and create motor output. The PNS coordinates action and responses by sending signals from one part of the body to another (From the various receptors such as mechano-receptors and dermatomes to the brain stem). The PNS includes all other sensory neurons, clusters of neurons called ganglia, and connector neurons that attach to the brain stem and other neurons. The brain stem connects the rest of the brain with the spinal cord. It consists of the mid-brain, medulla oblongata, and the pons. The primary input into the brain stem are through the Area Postrema (AP) and Nucleus Tractus Solitarius (NTS). Motor and sensory neurons extend through the brain stem, allowing for the relay of signals between the brain and spinal cord. Ascending neural pathways cross in this section of the brain, allowing the left hemisphere of the cerebrum to control the right side of the body and vice versa. The brain stem coordinates motor control signals sent from the brain to the body. It also controls several important functions of the body including pain management, alertness, arousal, breathing, blood pressure, digestion, heart rate, swallowing, walking, posture, stability and sensory and motor information integration. Additionally, decades of research into dysfunction and disorders of the brain stem and associated impact on the nervous system and body, also point to the direct and likely benefits of a brain stem not in dysfunction or disorder, or seemingly in homeostasis. Our research has led to a number of conclusions and developments. Firstly, we have concluded that these different receptors (parts of the PNS) do have an integrative relationship between themselves and do correlate to specific nervous stimulation and signals that can be sent through General Somatic Afferent (GSA) Pathways, Special Somatic Afferent (SSA) Pathways, General Visceral Afferent (GVA) Pathways, and Special Visceral Afferent (SVA) Pathways to the brain stem. Furthermore, we see evidence that these signals can be very specific and can help the brain stem reach homeostasis (equilibrium) and seemingly enhance the functions of the brain stem and the reticular nuclei, the monoaminergic and cholinergic nuclei as well as the parabrachial nucleus and periaqueductal gray. VOXX HPT is a very specific sequence and pattern of neuro-receptor activation on the bottom of the feet that triggers a signal that aides in the brain stem reaching homeostasis. The VOXX HPT pattern is woven or molded into different iterations of products including hosiery and footwear accessories. The concept is simple. The science is proven. The results are extraordinary. Tip 1: If you are ordering from the United States & you do select USA on the pop-up "Shipping Confirmation" window, but the ship to section still says Canada, click the tab that reads "Hello, Your Name" then click "My Account". Select "Edit Full Profile" Section & change your Ship to and Bill To country as well as enter your full billing and shipping address. You will be re-directed to our secure www.VoxxLife.com/TryTheSocks Replicated Web Site to shop. Golf Lab: Voxx in conjunction with The World’s Number #1 Golf Company, double blind studied 72 golfers for distance and accuracy improvements with Voxx HPT. 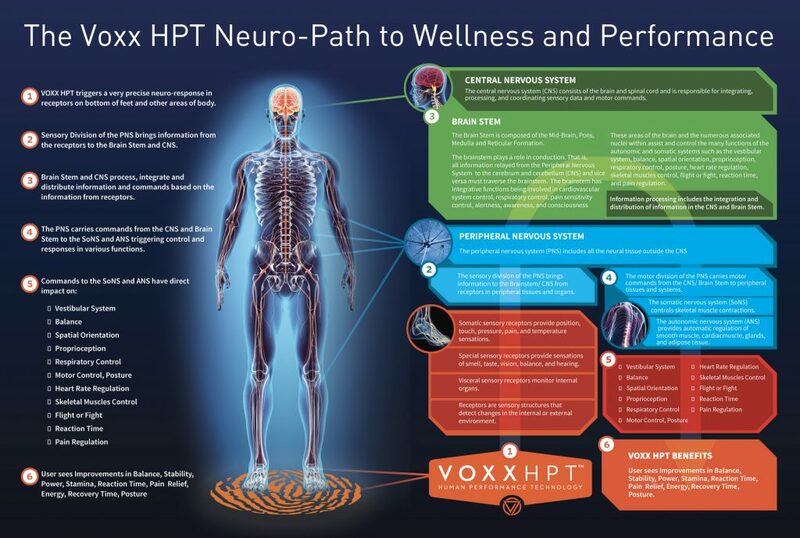 A 1,000 person study conducted through 3rd party rehab clinics tested Voxx HPT efficacy on foot pain and energy levels.